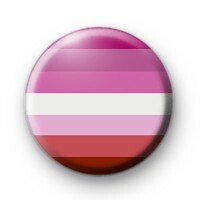 Colourful pink Lesbian Pride Flag Button Badge this gradient pink coloured flag was made to represent homosexual women in the LGBT community. Our Pride flags are great to wear to your local pride event. The Lesbian flag is just one of our huge range of LGBT flags available we also have bisexual pride badges, lesbian & gay badges, pansexual and many more too. Have a look through our gay pride badge section for our other designs. All our badges are 25mm/1-inch in size.